Although we talked about Samson being real with God in the previous chapter, after reading the beginning of this chapter, we can deduce that perhaps Samson wasn’t real with God about everything. Was Samson still hurting from his betrayal and heartbreak, after his Philistine wife was given to his Best Man and then killed by her people? Did he fail do deal with this hurt which led him to find temporary solace with a prostitute and with Delilah? Many Bible commentaries are quick to brand Delilah as this manipulative woman which she was, but ‘it’s not every day blame the woman, sometimes let the man take responsibility for HIS actions’, read the story with fresh eyes. Oftentimes, like Samson, we fail to deal with our pain and pride, which clouds our discernment, causing us to make unfavourable decisions. Surely, Samson would have understood Delilah’s schemes after the third time, but His pride got in the way of sound judgement. He allowed himself to be swayed by flattery and he told Delilah those things to prove his strength and massage His ego. We would have thought that Samson would have learnt to be careful when it comes to sharing intimate information and this time it was information concerning his Nazarite (belonging to God from birth through an oath) status. Samson trusted his fate to a woman who didn’t believe in the things that he did and in the end it cost him His life. Who do you trust? Do they share your beliefs and morals? Is there a hurt that you’re holding on to right now? Take it to God, deal with it, so that it doesn’t become a liability in your life. How many times have you allowed yourself to be deceived by flattery? Don’t allow anyone- man with the words, or woman with the charming smile, no matter how persuasive or attractive- talk you into doing wrong. Avoid being deceived by knowing the difference between deception and truth. When bankers study cash notes, they don’t study the counterfeits. 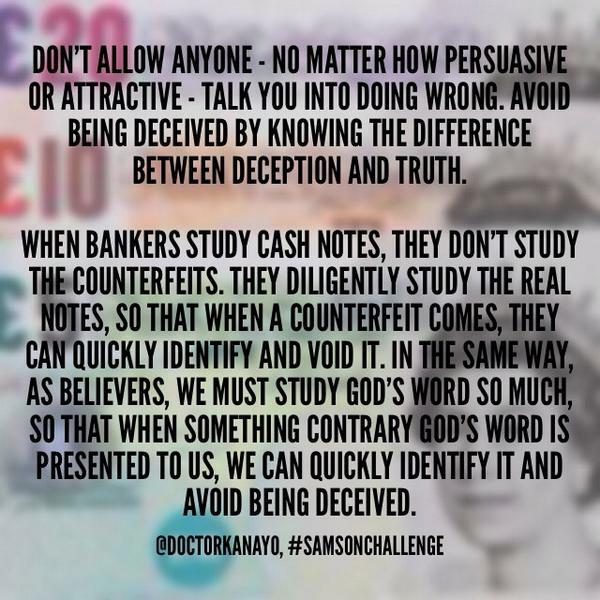 They diligently study the REAL notes, so that when a counterfeit comes, they quickly identify it and void it. It’s the same with us, as believers we must study God’s word so much, so that when something that doesn’t line up with God’s word is presented to us, we can quickly identify it and avoid being deceived. Move onto #SamsonChallenge Day 6.